Oh My Pug, it was the first day of Pug Nationals and I was in pug heaven!!! 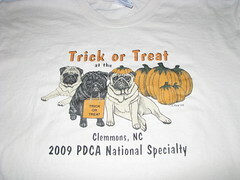 There were so many great pugs there with so many great breeders and handlers. It was a miracle that I made it through the week without ripping a page out of Pug Talk and asking someone for their autograph and their pug’s pawtograph (I made that word up). So what are Pug Nationals, because really I did not know all about it until I got there? It was a week to show all the things that pugs can do in agility, obedience, rally, and conformation. The first two days were hosted by the Central Carolina Pug Club, one day was dedicated to agility, and the last two days were hosted by the Pug Dog Club of America, Inc. So the next question is what was I doing there? I don’t have a pug that competes in any shape form or fashion. I would love to say that it was peer pressure, but honestly this was a wonderful time to see old friends and to make new friends all centered around the love of pugs. Another driving reason for wanting to spend seven days in a hotel with hundreds of pugs was that this was an amazing photographic event. It really put what I’ve learned from classes, reading, and real world experience to the test. And if this was a test, I failed on Monday! Hopefully my cumulative score will be better by the end of the week! I really could not get into a rhythm taking pictures on the first day. Part of it was from being so tired (see below), part of it was from just pure sensory overload and not being able to focus, and part of it was that I was just plain too busy looking around to actually concentrate on getting good shots. This venue was completely different from any shows that I’ve attended in the past. The ring was large and rectangular verses the small square ones that I’m used to seeing. Also, there were so many people that by the time that I got up and got downstairs, I was sitting up against the back wall. I did manage to squeeze closer up front as people got up from their seats, but I did wasn’t able to get a primo spot like I have been able to do at other venues. Once again, the dreaded obstacle of lighting was a huge hindrance. There were overhead florescent lights and light coming in from the windows and light coming in from a back door, but it just all clashed and didn’t make things easier to photography, if anything it made it harder. This was why I was here though to learn and to practice, practice, practice. By the end of the day, I got just a handful of photos and was completely exhausted by the whole experience. I can’t believe that I am lucky enough to even attend this event! Speaking of exhausted, let me tell you why I started the day out tired. First, on Sunday I left Chattanooga at a descent time and expected to be in North Carolina by about 6:00-6:00pm at the latest. Unfortunately, there was a road detour on a section of I-40 from Tennessee to Asheville, NC. There had been a rock slide onto the road so all traffic was detoured off I-40 onto back country roads. I have to say the drive was beautiful with the leaves changing colors, except for the fact that the roads were hair-pin and “S” curves coupled with bumper to bumper traffic. So I finally made back to the interstate where I was able to pick up Cindy and Prada and get to the hotel to get checked into our room. The room that I booked in February was on the second floor of a hotel with no elevators so it took about 20 trips going up and down the stairs to bring all of our stuff inside. Then Cindy is on West coast time so she was still up watching TV at 1:00am; while I go to bed at 11:00pm on the dot. Then at 4:00am the air conditioning starts making this horrible sound. Not the kind of sound where you can just roll over and sleep through it either. To top it all off, it still made the sound AFTER we turned it off too! So Cindy went downstairs and got us a key to another room and in our PJs we gather up Prada and a few things and go to another room to sleep. This room was much better so the next morning we re-pack all of our stuff to move down the hall into another room. Now you can see why I was so tired on the first day! 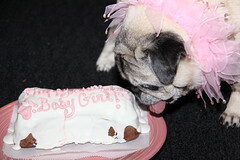 We celebrated Baby Girl’s 11th Birthday tonight. She turns 11 years old tomorrow! We love you Baby Girl. You are currently browsing the papaspugs.com Blog blog archives for October, 2009.